Private Drum Lessons in Boston, MA | Boston Drum Lessons - What Are Different Types of Drums? What Are Most Drums Made Of? The majority of drums produced today are constructed from plywood. If you own drums, chances are they were built using plies. These shells are built from thin sheets of wood glued together in a cylindrical mold. Most ply drums are between 5 and 9 plies thick, but some manufacturers produce drums up to 40 plies thick and beyond! Thicker shells result in a higher pitch (due to the smaller diameter), and using plies allows for a wide range of shell thickness. Different types of wood can be combined to create more tonal possibilities. Drums built from plies are relatively easy and cheap to mass produce in a variety of sizes compared to other construction techniques. However, most drum builders agree that the extensive use of glue can negatively impact a drum's tone and resonance. The up-close picture below displays the individual plies of this particular drum, as seen by the slight differences in color between each ply. How Are Stave Drums Made? Stave drums are constructed from small nearly-rectangular blocks of wood arranged into the shape of a cylinder - the same way barrels are built. 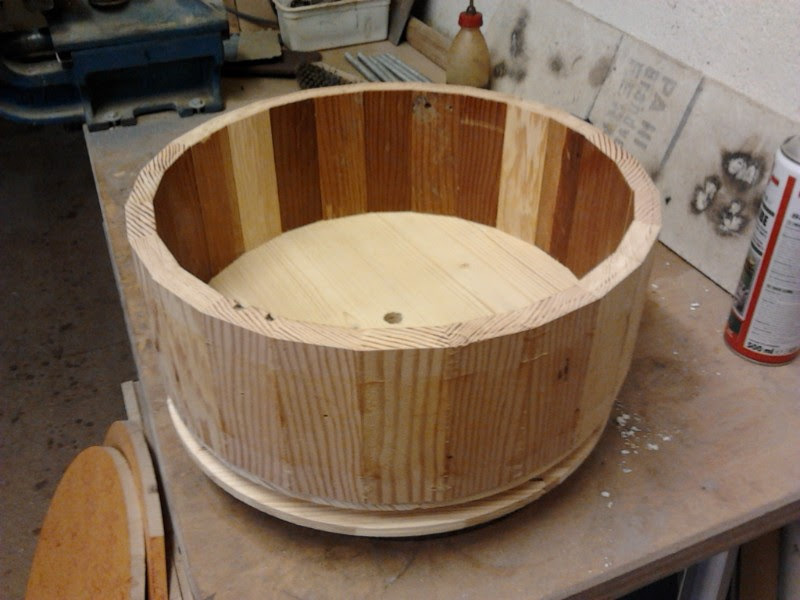 These blocks are glued and clamped together to ensure the drum holds its shape. The picture below exhibits a stave drum in the very early stages of construction. It has been glued together, but still requires rounding, cutting of the bearing edge, sanding, and drilling holes for hardware before it's ready to meet a drumstick. Stave drums are typically much thicker than drums made from plies and produce a higher pitch as a result. However, since the blocks require far less glue compared to ply shells, more of the tone comes from the wood resonating instead of the drum head. Stave drums are most common among snare drums, but plenty of custom builders construct full drum sets in this style. Stave drums are typically more expensive than ply drums, due to the inability to mass produce them in a cost-effective manner. How Are Steam-Bent Shells Made? Steam-bent shells are built from a solid plank of wood. Each plank is soaked and steamed until the wood becomes soft enough to bend into a circle. The steamed planks are forced into shape and glued at the meeting ends. Steam-bent drums frequently include internal reinforcement rings, which help prevent the plank from bending out of its cylindrical shape. Since these shells require so little glue, they produce a very warm, open, sensitive tone. This technique predates almost all modern techniques by hundreds of years, but the time and labor required to craft these shells justifies their high cost. The picture below depicts a finished steam-bent shell, including reinforcement rings. There are a few other techniques to shell construction, such as segmented shells (similar to stave construction, but with horizontal semi-circular pieces of wood) and solid shells (built from hollowing out a log). These techniques apply to building drums from wood, but some manufacturers construct drums from different materials, including metals, acrylic, and fiberglass. Some builders even combine various materials within the same drum to produce truly unique tones. Each technique and material possesses exclusive characteristics, so it's up to you to try them all and find what best suits your sonic desires. If you're interested in trying to build your own drum shells, this site (although it looks a little dated) provides a deep well of information, discussion, and insight into each method. If you'd like to chat more about different types of drums and how you can learn to play them, just get in touch with us at Boston Drum Lessons!